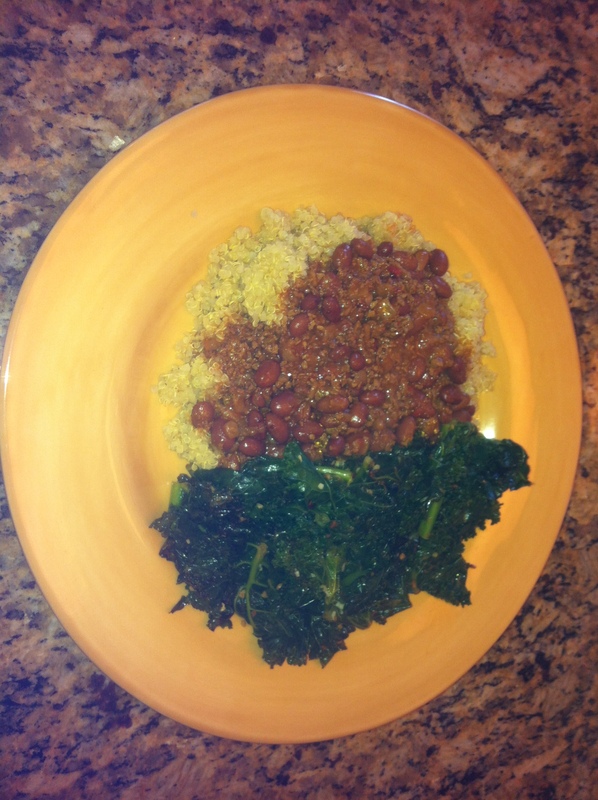 Quinoa cooked in low-sodium chicken broth, veggie chili from a can (Amy’s brand), fresh kale sauteed with garlic in olive oil. I cook quinoa in pretty big batches every few days so that was already prepared. The rest of the meal took about 10 minutes. Total cost for the meal with all organic ingredients was about $3/person. With non-organics this meal would cost about $1.50 per person. Cheaper than the slop from an extra value menu and quicker than a drive-through. Yes, everyone has enough time and money to eat well! Yum!! (Although I don’t know if my spouse would be real enthusiastic…especially about paying extra for organic.) Enjoy! I think the organic aspect is fairly low on the priority list. Far more important to choose quality foods – real foods that aren’t chock full of additives and fillers – than to fixate on whether it is organic. That said, while it may cost upwards of twice as much to buy all organic food, the actual dollar cost per meal isn’t much of an issue for most people. Varied, tasty, filling meals made with organic ingredients (including meat for those who want it) can easily be made for a few dollars per person. Basically the same price as fast food.